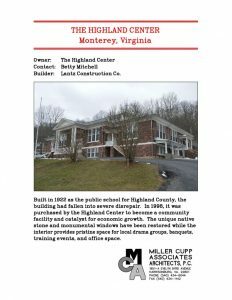 The Highland Center – Miller Cupp Associates, Architects, P.C. Built in 1922 as the public school for Highland County, the building had fallen into severe disrepair. In 1998, it was purchased by the Highland Center to become a community facility and catalyst for economic growth. The unique native stone and monumental windows have been restored while the interior provides pristine space for local drama groups, banquets, training events, and office space.